P22 is probably the most famous mountain lion in the world. 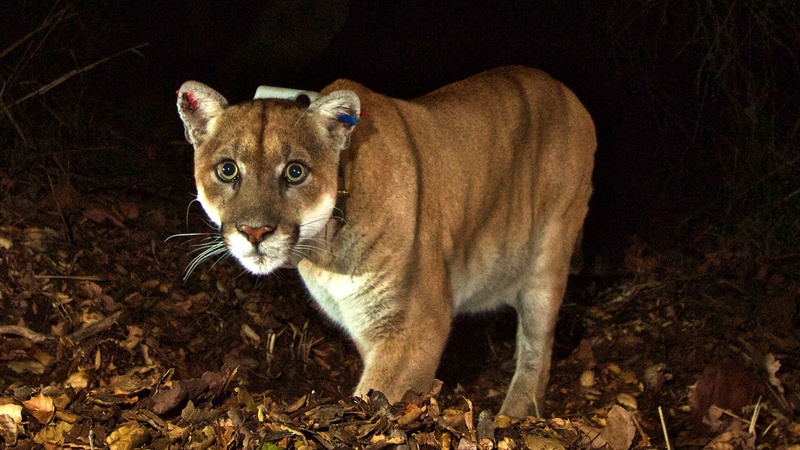 He crossed two major freeways, the 101 and the 405, to get from the Santa Monica Mountains to Griffith Park, where he now prowls without a mate. Mountain lion P22 is seen prowling Griffith Park in a remote photo. Photo credit: National Park Service. The 101 divides what was previously a contiguous ecosystem into isolated habitat fragments, resulting in territorial fighting and inbreeding. 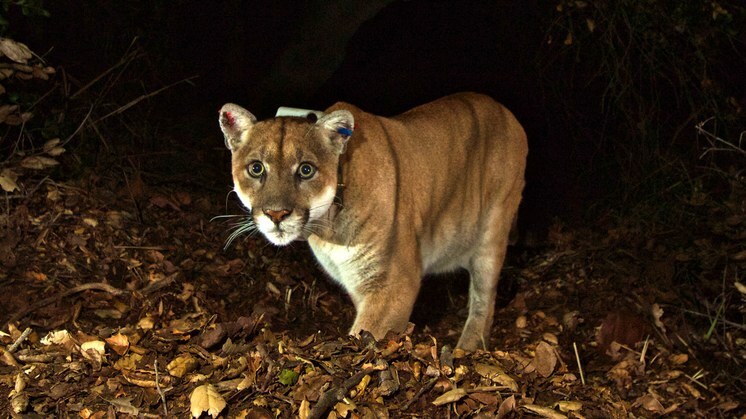 So Caltrans is proposing to build a wildlife crossing, for lions and other species, spanning ten lanes of the 101, just west of Liberty Canyon Road in Agoura Hills. It will serve as a habitat restoration, rebuilding a section of the mountainside that had been cut away. It will be the first of its kind in California and the biggest in the world. It is estimated to cost $60 million, and is set to be completed by 2022. 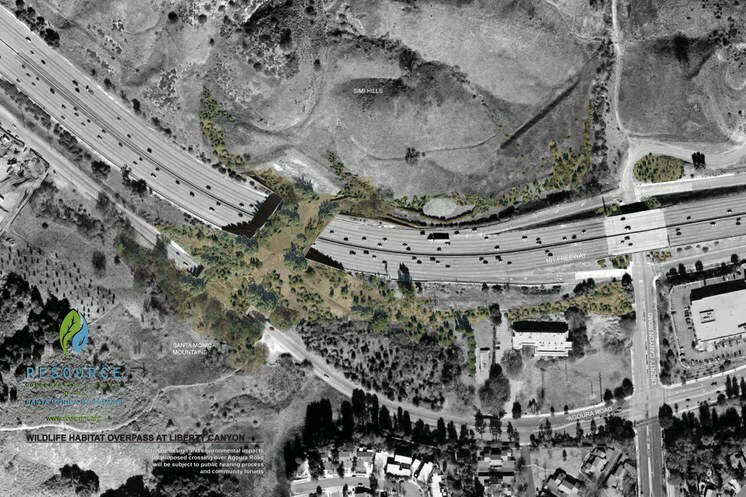 One rendering of the proposed Liberty Canyon Wildlife Crossing over the 101 freeway in Agoura Hills. Image courtesy Caltrans. And this bridge for the wilderness represents a shift in approach by Caltrans to infrastructure building, which is now trying to reconnect human and animal systems rather than separate them. “Freeways are unique in that they can kind of divide up habitat and territory in a way that other infrastructure cannot, and I think that Caltrans wants to play a role in rectifying that problem in the future,” says structural engineer Ulysses Smpardos. On this show, we hear what’s involved in the construction of this mammoth project. And we ask: What about those who fear the proximity of more lions? What does it teach us about the interrelationship of animals and humans in urban centers? DnA spoke with advocates and a staunch opponent of the bridge; transit engineers and architects who are using scent and plantings to design a wildlife crossing; and conservationists who have turned P22 into a poster lion for animal-wildlife coexistence. We also take a trip to the Korean DMZ to see what happens when humans leave a strip of land for decades and allow flora and fauna to run wild. We’ll ask if wildlife thrive in islands of green, and find that animals need linkage, even when it intersects with urban development.